James Files - The Early Days? In the first paragraph Files says he can not "be of some help to you [West]." In the second paragraph Files affirms what he said in paragraph # 1 and maintains he knows so little about West's inquiry into the Kennedy assassination that his "knowledge of [West's] investigation is not worth the cost of your coming to see me." Although Files' supporters said he was not well read on the Kennedy assassination, in the third paragraph he admits to seeing movies and reading books about the event. He claims, incorrectly, that Phillips committed perjury. Phillips did what many government officials do to this day - they develop hazy recollections of events, parse their words, or place themselves in a position of plausible denial. This was and is done intentionally to AVOID the charge of perjury. Files then uses the Fallacy of Appeal to Popularity by claiming that West is probably already aware that Phillips is guilty of perjury. In the fourth paragraph Files suggests "the man in the beat up fedora type hat wearing the old brown leather bomber jacket" looks like Frank [Fiorini] Sturgis. Files spells Sturgis' name incorrectly and never reveals, to West, what personal information led him to his conclusion. Files records "The last I heard, he's [Sturgis] alive and doing well." 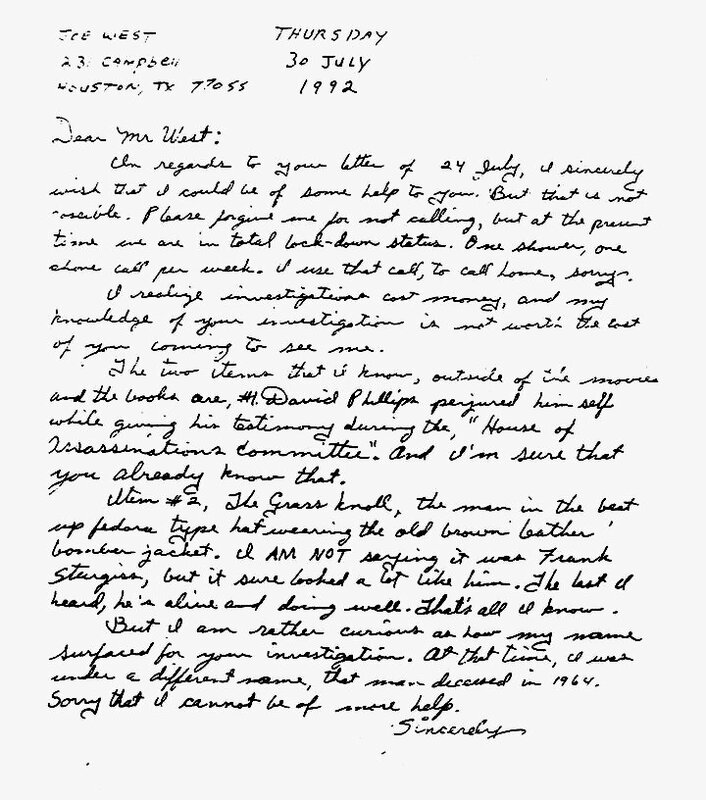 The fact that Sturgis was "alive and doing well" at the time of Files' letter to West was information available to anyone with an interest in the case. However, sixteen months later Sturgis would be dead of lung cancer. He died on December 4, 1993, just 5 days short of his 69th birthday. In the last paragraph he wonders "how my name surfaced for your investigation." From an article that appeared in the April 11, 1994 Beaumont [Texas] Enterprise it seems that in April of 1992, a Beaumont FBI agent Zack Shelton, most likely in deference to FBI policy, gave Files' name to Joe West, a private citizen. In regards to your letter of 24 July, I sincerely wish that I could be of some help to you. But that is not possible. Please forgive me for not calling, but at the present time we are in total lock-down status. One shower, one phone call per week. I use that call, to call home, sorry. I realize investigations cost money, and my knowledge of your investigation is not worth the cost of your coming to see me. The two items that I know, outside of the movies and the books are, #1. David Phillips perjured himself while giving his testimony during the, "House of Assassinations Committee." And I'm sure that you already know that. Item #2, The Grass knoll, the man in the beat up fedora type hat wearing the old brown leather bomber jacket. I AM NOT saying it was Frank Sturgiss, but it sure looked a lot like him. The last I heard, he's alive and doing well. That's all I know. But I am rather curious as how my name surfaced for your investigation. At that time, I was under a different name, that [man deceased?] in 1964. Sorry that I cannot be of more help.